1. How many beats are there in whole note? 2. Which cymbal is played on the first beat? 3. What does 4/4 means? 4. What are two major pedals? 5. Write a sign of Flam. 7. What materials are used in tune drums? 8. Draw a treble clef. 9. Write the formula of major scale. 10. Name the note when a diminished note is raised a half step. 11. Write down the scale of D minor scale. 12. What is a 3rd note on a F major scale? 13. Which note will be on the top in 2nd inversion? 14. Make four combination roll of quarter, eighth and sixteenth note. 15. Draw a drum set and name the parts. 16. What is para diddle? 17. What is an interval? Write its types. 18. What is staff notation? Draw its types and name them. 19. Define a triad. Write its types. 20. Differentiate between minor and inversion. 21. What is metronome? Why is it important? 22. What is rock rhythms? Make your own four bars of rock beat. 23. Explain farm and grip. 24. What is diatonic chord progression? Explain its procedure with example. 25. Explain the importance of music theory in music. 26. What is inversion? Explain it with example. 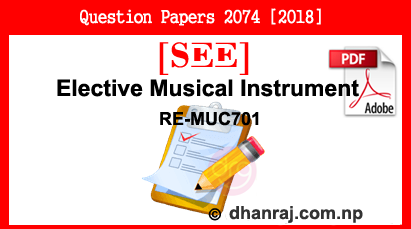 0 Response to "Elective Musical Instrument | Exam Paper | 2074  | RE-MUC701 | SEE"